Margot was the program manager for Ti Kay from September 2013 to July 2014. 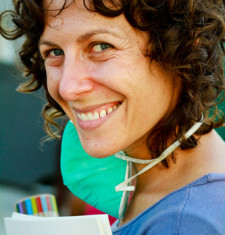 Prior to living in Port au Prince she worked as a nonprofit lawyer in New York City for several years. she is currently attending medical school at UCSF, but she still comes back to Ti Kay when she has time off. Her favorite thing about coming back is the hugs from old patients and clinic staff. Margot te chèf jesyon ak pwogramasyon Ti Kay depi septanm 2013 jouk jiyè 2014. Avan li te vin abite an Pòtoprens, li tap travay kòm avoka a bi non-likratif nan vil Nouyòk pou plizyè ane. Aktiyèlman li nan fakilte medsin nan UCSF, men li konn vin vizite Ti Kay lè li disponib. Sa li plis renmen lè l tounen se anbrase ansyen malad yo ak ansyen manm staf klinik la.